In part 1 of “A Better Investment Experience”, we discussed the importance of embracing market pricing and avoiding chasing performance. In part 2 of this series, we’ll focus on managing the emotions of investing and the characteristics of a sound investment plan. Emotions play a major role in our investment (and life) related decision making. A downside of these emotions is that they often cause us to think and act irrationally despite whatever fact-based evidence we are shown. Finding a way to manage these emotions is key in finding a path towards a better investment experience and ultimately achieving your long-term investment goals. Emotions aren’t all bad obviously, but making big financial decisions based solely on emotions is a recipe for disaster. In order to manage them, we need to know how these emotions manifest. Here’s a typical cycle of investing related emotions that you’ve no doubt come across in some form. When things are good, we buy more. When things are bad, we want to sell and go to cash. Another way to put this is that our emotions can cause us to want to buy high and sell low… not the best strategy. Let’s take a stab at answering these questions. First off, history has shown that markets weather every storm and continue to move higher over the long-run. 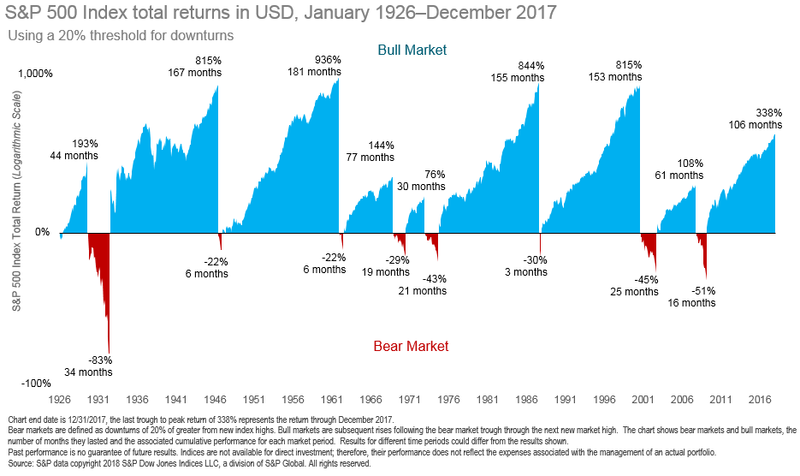 We can see from the chart below that good times for the market have been disproportionately longer than the bad times and the duration of a bull market is not a reliable indicator of the duration or magnitude of the next bear market. In reality, the consequences of missing part of the bounce can be more lasting than the bear markets themselves. This next chart shows the distribution of yearly US market returns since 1926 stacked by range. 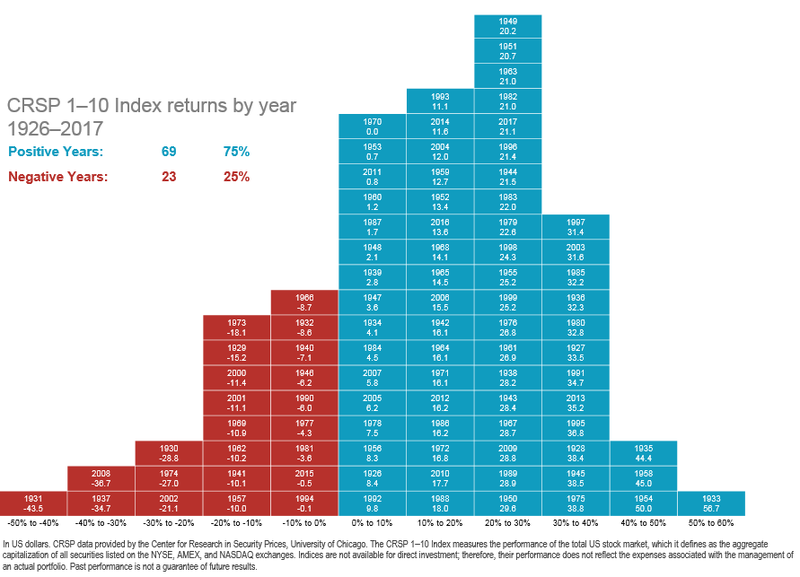 Over this time horizon, the market has had a positive annual return 75% of the time, with positive performance more concentrated in the higher ranges of returns. This is just another way of saying that the long-term direction of equity prices as a whole has always been up. To begin to answer this question, lets take a look at how the average investor (who likely exhibits emotional biases) has done over time relative to other asset classes. The orange bar represents the average investor’s annualized return from 1998 through 2018 (data was collected from thousands of anonymized brokerage and mutual fund accounts). The average investor, riding that emotional roller-coaster of elation and fear has done slightly better than inflation over the last 20 years (2.6% vs 2.1%). 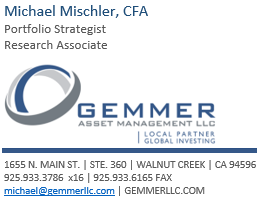 In contrast, buying and holding a 60/40 portfolio of stocks and bonds that is rebalanced annually produced a 6.4% annualized return. That 3.8% difference could certainly be the difference between meeting your financial goals and falling significantly short. Think you can time the market and come out the other side in one piece? Not as easy as it looks, and it doesn’t take much of a slip up to impact returns. We’ve shown the below chart before, but its worth repeating. Each bar shows the return after accounting for missing the best x number of days over the time period. 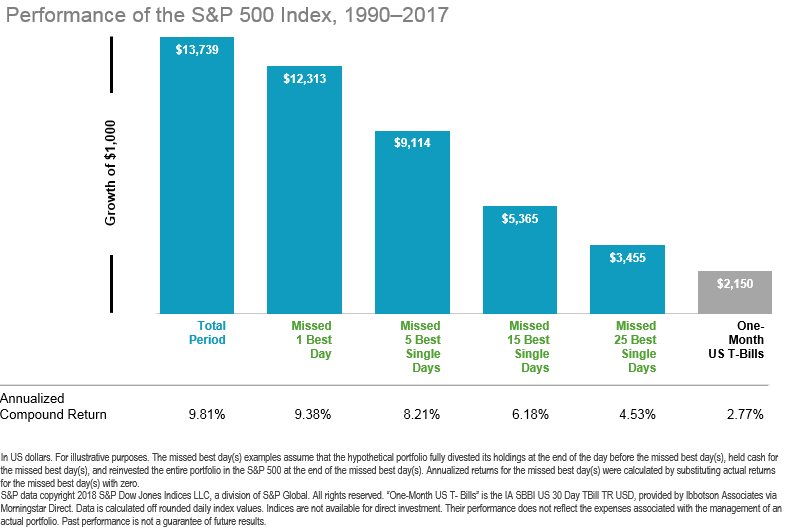 Missing out on even a few of the market’s best days each year can have a significant impact on cumulative returns. So, the bottom line is yes, reacting to short-term events can adversely affect long-term outcomes. Eliminating emotional biases is not going to happen. but being aware of them may help us think twice before we make an investment decision that lessens the likelihood of a secure financial future. Ok, you’re aware of your emotional biases and are sticking to your investment plan. Well, if that plan is garbage, all the emotional awareness in the world won’t ensure your long-term goals are met. Everyone’s situation is different, and there are enough idiosyncrasies in people’s lives that it would take pages and pages to cover every random scenario. There are however some common general characteristics of sound investment/financial plans. Accurate and specific accounting of assets, liabilities, income, expenses, taxes, etc. Again, this is by no means an exhaustive list, just some common traits to keep in mind as you think about your own plan. The ability to manage emotions is critical if we are to avoid making rash decisions that can affect our long-term financial security. Possessing a sound investment plan is equally as important. Having one of these things without the other however, is almost as bad as lacking both.